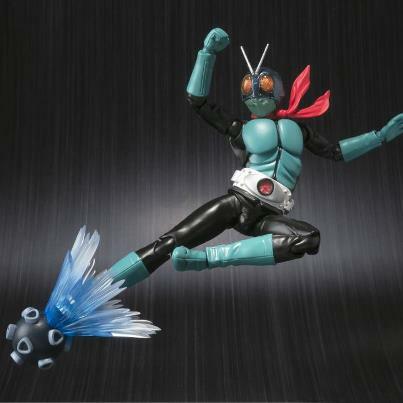 Bandai of Japan’s SHODO 4 inch figure line is expanding into Kamen Rider, and the first wave of SHODO Kamen Rider VS will appropriately enough feature characters from the Showa Era series. Though Kamen Rider 1 is the only one shown in the photos. The set of four will be released in September and will cost a wallet friendly 500 yen per and sold in cases of 10. 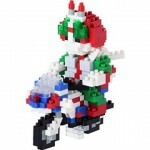 Once again almost falling out of the radar is October’s batch of Nanoblock Kamen Riders with Wizard Flame Style, Fourze Base States, Kamen Rider 2 and to round out the Showa rider trio: Kamen Rider V3! Fourze Base states will include all of the nessicary bricks to build him with his Rocket and Drill Modules for his Limit Break pose, meanwhile Wizard will include parts for his WizSwordGun and Connect spell poses. Much like Kamen Rider 1, Rider 2 and V3 will both include the nessicary parts to build their respective bikes: New Cyclone and Hurricane though will cost slightly more than Wizard and Fourze. V3 can also be built in either his signature pose or doing his Rider Kick. Wizard and Fourze both retail for 1500 yen, while V3 and Rider 2 cost 2000 yen. It’s that time of the month again people! New Tamashii Pickup reveals! First on the block is S.H. 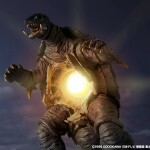 Monsterarts Gamera! Long awaited by Kaiju fans this version of the beast is based on his appearance in Gamera 2: Attack of Legion. Gamera Includes alternate wings and flame breath effect parts, and features an opening abdomen to replicate his Ultimate Plasma attack! Next up we have a pair of SHF releases. First is S.H. Figuarts Hurricane the signature bike of Kamen Rider V3! And a bit of an odd reveal is S.H. Figuarts Shadow Moon Renewal! This renewal appears to have bulkier proportions than the original but there’s no confirmation yet as to what else may be differentfor this figure. As always we’ll continue to update you as more information becomes available! As a perfect follow up to Kamen Rider Nigo coming in May, a Kamen Rider V3 in this brand new design aesthetic has been announced. No other release info as of yet, more on that when it becomes available. 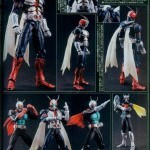 › Companies: Bandai of Japan › Characters: Kamen Rider V3 › Toyline: S.I.C. Bluefin’s Facebook Page page has been updated with release info on The North American release of Classic Rider 1. 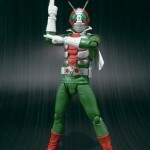 Classic Rider 1 will be released in August 2013, retailing for 29.99, he will include a Rider Kick Effect part along with swappable hands and weapons. 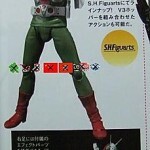 In addition, Bluefin has also announced that S.H.Figuarts Kamen Rider V3 will reissued in August as well. As the preorder windows for Bandai’s new July figures (Original appearance Kamen Rider 1 and Shocker Combatant) are about to open, Bandai have announced that the previous figures will be joining them that month for a second run! 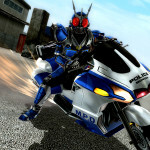 Kamen Rider V3 will be reissued in July, priced at 3150 yen. Joining him will be Ultra Act Zoffy, priced at 3360 yen. Check out the official images after the jump! 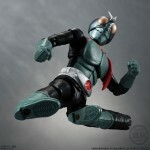 Tamashii Nations has released the official images of SH Figuarts Kamen Rider V3. The figure is planned for release in May for ¥3,150. It comes with an effect part and swappable hands. Thanks to TokuNation member Kiryu for the heads up. Check it out after the jump!